SUNRISE, Fla. -- The Florida Panthers are off to a great start in 2011-12, and their slew of newcomers has made a major impact. But perhaps the most important player in the team's early success is the guy who has been there the longest. While Kris Versteeg is on a scoring spree, Brian Campbell is piling up the assists and Tomas Fleischmann comes up with dazzling plays on a regular basis, center Stephen Weiss is scoring big points with his all-around game. "He's such a quiet guy that just goes about his business," first-year Panthers coach Kevin Dineen said. "There's such a high level of professionalism when he comes to the rink. He has a really strong effect on our team. When he's playing well, which he's done for so much of this year – that really has been a bit of the heartbeat of our team. "Stephen has really been the guy for me that has done such a quality job, not only offensively but against other teams' top lines as well. He's done a great job." A perfect example of Weiss' contributions came in Saturday night's 3-2 victory over the Pittsburgh Penguins. Weiss went up against standout centers Evgeni Malkin and Jordan Staal that night, and had the game-winning goal, two assists and a game-high five blocked shots. He also won 15 of 22 faceoffs. "Stephen is really the guy that runs the engine right now," Dineen said after that game. "He does so many good things for us, and tonight he needed to do it on the defensive side and then he had three points. When he's getting that kind of production and also going big minutes against really big, strong men, that's a pretty valuable guy." In helping the Panthers get off to an 11-6-3 start, Weiss has eight goals and 13 assists for 21 points, second on the team behind Versteeg's 25. Weiss also is tied for the team lead with Fleischmann at plus-14. At his current pace, Weiss easily would clear his career high of 61 points, set in 2008-09. Then again, Weiss has never really had linemates as skilled as Versteeg and Fleischmann. "It's a big credit to these two guys," Weiss said, pointing to his locker room neighbors. "We just seemed to gel very nicely and they're very easy to play with. You give them the puck and they hang on to it and make plays. We all play similar styles and with what we've been getting from our D as well, it's just been a nice four-, five-man attack for us. It's working out. "I haven't changed anything. I'm still trying to play the same way, at both ends of the ice. You add two guys like that – plus the D – it adds up to more production. We've just got to continue to produce." It has been a great start on many fronts for Weiss, who – in his ninth full season with the Panthers – has been around more than twice as long as any other player on the roster. The biggest thing, by far, is that the Panthers are winning. That's huge for someone like Weiss, who has played in 577 NHL games but has yet to compete in the Stanley Cup Playoffs. "I'm having a lot of fun," Weiss said. "It's fun to win and it's fun around the dressing room. When you have guys that care about winning and playing for the same reason, it's fun to come to the rink and do that. Now we've just got to keep going." The only current player who has played more games than Weiss without a playoff appearance is Calgary defenseman Jay Bouwmeester, a former teammate with the Panthers. 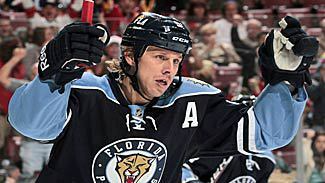 Weiss and Bouwmeester were among five top-10 picks the Panthers had between 2001 and 2006, the others being Nathan Horton, Rostislav Olesz and Michael Frolik. When the Panthers traded Olesz to Chicago for Campbell during the offseason, Weiss became the last one left in Florida. His standing on the team became obvious when Dineen appointed him as one of four alternate captains, along with newcomers Campbell, Ed Jovanovski and Tomas Kopecky. "He's impressed me," said goalie Jose Theodore, another new teammate. "He's a really complete player. He's good defensively and offensively, and you see he's been here from the start and the team hasn't made the playoffs and he's another player who's tired of being out of the playoffs. So he's going to do everything in his power to take the team to the playoffs and you can see he's really on a mission." For the gregarious Versteeg, his low-key center has proven a great complement -- on and off the ice. "He's not obnoxious like myself, I'd say, with talking and stuff like that, but he'll talk and he'll say his piece," Versteeg said. "And when he speaks everybody listens because he's not one of the guys who wants to speak much. But when he does, it's from the heart. "We want to win for a guy like Weisser. He hasn't been to the playoffs yet and he hasn't gotten to experience that taste. This is something we want to do for guys like that and really have their spirits lifted and have them feeling good about themselves and knowing they're playing in the NHL, not just to play but they're playing to win, too." For Weiss, the hot start -- on both an individual and a team basis -- has been a just reward for sticking with the Panthers when others deserted. After he took over as general manager in May 2010, Dale Tallon reached out to the players to find out which ones wanted to be part of the rebuilding project and which ones preferred a change of scenery. Horton requested a trade and was sent to Boston, where he won a Stanley Cup last spring. Weiss never hesitated in saying he wanted to stay in Florida. These days, Weiss and the team have to love that decision. "I'm proud to still be here," Weiss said. "There's been some tough times when you wonder which way your career is going, but I had a lot of faith in Dale and I just wanted to be a part of what he was going to do here. After what he did this summer, I was super excited to come to camp and try to build something down here. We're slowly going in the direction we want to go."